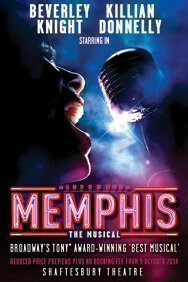 This Broadway export of the Tony Award winning musical MEMPHIS to the West End, is very good news indeed for London theatregoers. Although it has an original score that the majority of the audience didn’t know, it had everyone leaping to their feet and roaring their approval on the night I saw it. The likelyhood is you'll feel the same way. The show tells the story of how Huey, a geeky, white Memphis DJ won't take no for an answer when he sets out to convince the mainstream record buying public that they should be listening to music from the black community, specifically as sung by his girlfriend, Felicia. This being 1950’s America that music is down and dirty, great rock and roll and glorious harmonic soul and gospel. Unfortunately 50s America also means the protagonists encounter terrible racism. Luckily our hero is pretty socially dysfunctional and won’t let anything stop him forging a path through mistrust and animosity from both black and white opponents. Although it feels like a literal, true story clever writer Joe DiPetro has amalgamated several real life music pioneers into his central characters. There’s a few lurches in the plot that strain credibility but this is a very satisfying Cinderella tale even if Cinders’ beau is no prince charming. When I saw this show in New York it was hard to imagine the glamorous angsty singer and the manic, Robin William’s like DJ having a future together, or to care much but this London revival is blessed with two extraordinary central performances. Killan Donnelly displays far more vulnerability than his Broadway predecessor and is subsequently much more likeable, whilst every moment that Beverley Knight is on stage persuades you that you’re in the presence of a superstar. Not only is she ravishingly beautiful but her glorious voice, belting the hell out of the songs, is worth the price of a ticket alone. Every moment that Beverley Knight is on stage persuades you that you’re in the presence of a superstar. Her glorious voice, belting the hell out of the songs, is worth the price of a ticket alone. Those songs are co-written by DiPetrio and David Bryan, the keyboard player from 80’s super group Bon Jovi and any reservations you may have about two white guys writing black music are banished in a heart beat, the moment the opening number kicks in. From then on it’s a fabulous tidal wave of heartfelt soul, soaring gospel and get-up-and-dance high spirits. The whole thing is impeccably cast by Pippa Ailion and everybody makes an impression, even in the supporting roles. Rolan Bell as Felicia’s brother Delray manages to be both intimidating and display vulnerability, Claire Machin who was recently so funny as a frumpy secretary in the PAJAMA GAME at this same address, returns to give an extraordinary performance as Huey’s mum; developing from down trodden despair and ingrained racism to become an open minded, warm, loving woman. Mark Roper is wonderful as Huey’s radio station boss, at first aghast then very proud of his maverick DJ and Jason Pennycooke steals every scene he’s in as a janitor who finally gets to demonstrate what an amazing singer he is. But it’s the casual racism that gives the show its grit, depicting quite how badly black people were treated. For a black person to even brush past a white person was frowned upon so you can imagine the kind of bigotry Huey and Felicia face when they contemplate a life together. The whole thing is impeccably cast by Pippa Ailion and everybody makes an impression, even in the supporting roles. This is a terrific evening, incorporating great songs, high drama, plenty of comedy and some amazing performances. If you only see one show this autumn, make it this one. A simple, no frills, heart wrenching production delivered with catchy original songs. The replacement cast is not quite up to scratch compared with the original, but this is definitely one to catch before it leaves the West End in March 2015. Normally when a family member comes to stay, I inwardly groan. Now that’s not because I don’t love my family, but it does seem to be hard work taking tourists around the city of London. My flatmate on the other hand has a much more relaxed family, so when her sister came to stay with us I was excited at having another person to go to the theatre with. Not only an artistic soul like us, she is also applying for drama schools at the moment to do stage management and so was more than happy to tag along and pass comment on a musical with me. She really seemed the perfect choice to take along to the Phoenix Theatre and watch an Olivier award-winning musical before wandering to get a drink at half time from the on-stage bar and soak up the atmosphere.